American Insert Flange | Manufacturer of insert flanges for single and jacketed piping applications. American Insert Flange Company, Inc.(AIF) is a manufacturer of insert flanges for single and jacketed piping applications. We sell to a wide variety of distributors, fabricators, and other types of customers who service the pipe, valve, and fitting (PVF) industry. AIF was started in conjunction with our sister PVF company Specialty Flange and Fitting, Inc., a provider of stainless and specialty alloy PVF products for over 25 years. Click on their name to enter their respective web sites. Insert Flanges are a specialty, two-piece flange that have been used in the industry for over 75 years. 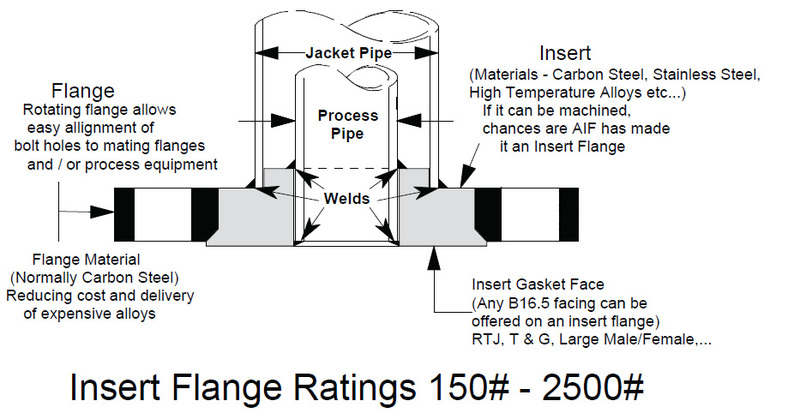 If you grasp the concept of a standard flange, understanding insert flanges is simple! The flange is usually made from carbon steel since it does not touch the pipe, this allows the insert to be made from stainless or specialty alloys to match up with your specific piping. The insert flange for jacketed pipe is a unique flange because it caters to your personal size and schedule requirements for the process and jacket pipe. This allows for a perfect fit and can make fabricating a jacketed piping job easier with less prep time. At AIF, we offer insert flanges in many different styles and weight classes. See our Product Page for details! All of our insert flanges are backed by detailed engineering calculations to meet the strict ASME code regulations of today’s marketplace. Insert flanges are based off of standard ANSI B16.5 flanges, therefore, most dimensions are the same, such as raised faces, bolt holes, and outside diameters. This allows for an easy transition from standard flanges to insert flanges. There is no better test, than the test of time. Insert flanges have been used successfully around the world in chemical, food processing, pharmaceutical, and any other company where piping is used for over 75 years!